If you have any questions or want to enquire about dates, use our form to contact Françoise & Christian or see their website for more information. 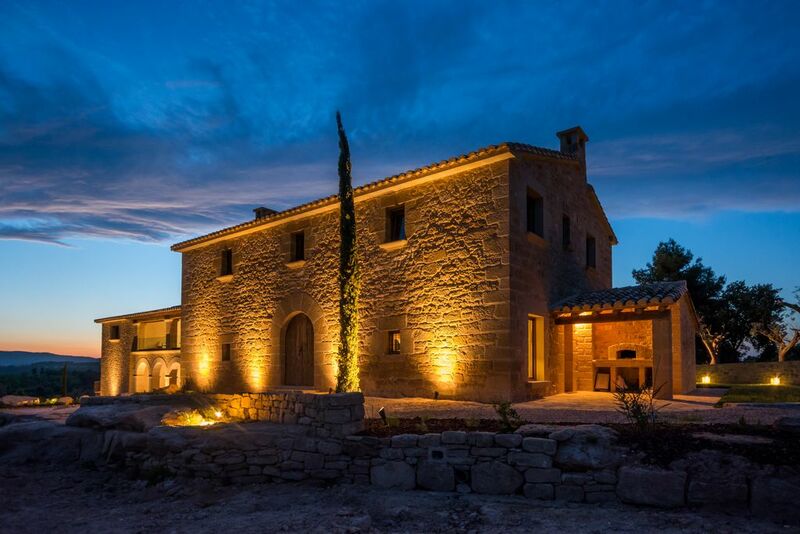 A 200-year-old country house just across the border of Tarragona province, beautifully restored – and added to – by conscientious owners. Gaze on wide views from behind a lavender and rose fringe, across terraced gardens and meadows, to the far hills; swim up to them in the salt-water infinity pool. Every detail is carefully considered, from the planting through to discreet car parking and solar panels; no need for air con as underfloor heating turns to underfloor cooling. Everything is of high quality. Well designed indoor spaces framed by stone walls, wooden beams and ceramic floors come with pale sofas, a medium grand piano, open fire places, an honesty bar, a cinema room, a Spa area, a gourmet restaurant in the former stables – great kitchen or outdoor breakfasts too. Bedrooms, in restful colours, have king beds, excellent mattresses and linen; bathrooms have wide modern showers and hand painted tiling. Suites have fireplaces and logs are provided. Hire bikes or hike through the spectacular rock formations of the Matarraña and neighbouring Catalonia; visit the nearby Picasso centre. Early November to early December; early January to mid-February. Reception always open for enquiries. Buffet breakfast included in the price. Dinner from €45. Restaurants 3km. Dinner, B&B €50-€65 per person. I felt pampered and loved without being overwhelmed. Everything conspired to make our stay very special. It was as though our wealthy but unpretentious friends had invited us to stay in their very beautiful home and then allowed us to indulge our own fancies whilst kindly and quietly attending to our every need. Set on the edge of the nature reserve of the Puertos de Beceite: Hiking trails through pine & oak covered mountains; rich wildlife, such as the Spanish ibex (capra pyrenaica) -a shy mountain goat with impressive horns-, and a large population of vultures. Bicycling down the Via Verde, an old railroad track through mountains and tunnels. Not to worry: They can come and pick you up at sea level ;-) There are also near-by stables for horse-back riding. Kayaking and mountain climbing are also possible. Natural pools – Cristalline waters: in the summer, a large number of shallow natural pools in the area are a delight for old and young alike. Combine a family picnic with a swim. The Pesquera is a beautiful natural pool near Beceite. Within a day-trip’s reach: The medieval ramparts of Morella (40 min). - Superb examples of Mudejar art in Teruel, Calatayud, Tobed, Zaragoza. - Impressive Roman remains (theatre, aqueduct, triumphal arch) in Tarragona, the Roman capital of Tarraconensis.